In Windows there’re perhaps only a couple of important folders (by important I mean important in my logical picture of the Windows file system) in the installation drive (in my case C:\). Namely Program Files and Windows. I simply stay away from Windows folder and the “add remove program files” is good enough to handle the program files folder of Windows. Of course there’s a folder named Users where the users (who are not admins) can access only their folders. Thus there’s a clear picture at some level in my mind of the Windows file system. In Ubuntu, when I reach the location /, there’s a huge list of folders, most of which I have no clue as to what they contain. The /bin folder seems to be the equivalent of the Windows folder in windows. The /usr folder seems like it’s the equivalent of the Users folder in Windows. But even the /home folder looks like it can fit the bill. Please understand that I do understand, that Ubuntu (Linux) has a different character than that of Windows, i.e., there need not be exact equivalent of Windows functions, in Ubuntu. All I am looking for is a bit more clearer picture of the Ubuntu file system. 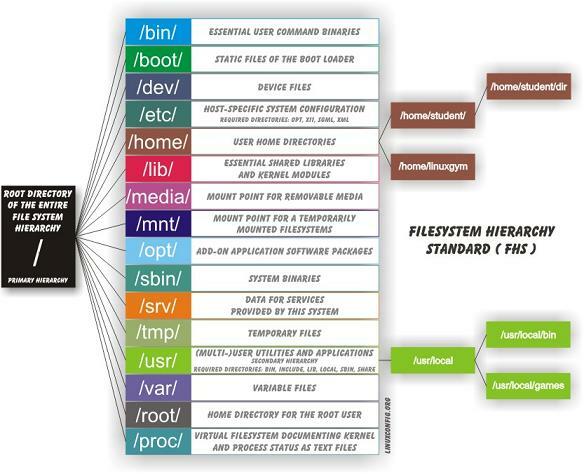 The Filesystem Hierarchy Standard (FHS) defines the main directories and their contents in Linux operating systems. For the most part, it is a formalization and extension of the traditional BSD filesystem hierarchy. The FHS is maintained by the Linux Foundation, a non-profit organization consisting of major software and hardware vendors, such as HP, Red Hat, IBM and Dell. The current version is 3.0, released on June 3, 2015. Basically Linux has divided the directory structure based on the function of what is needed to make the system as secure as possible with the minimum amount of permissions needed. Otherwise someone is bound to have to do alot of avoidable work. Remember that Unix and Linux where made as multi-user systems and Windows was created for a single user. Everything else can be explained from that idea. You can explain every directory when thinking about it being multi-user and security. You will see that files and directories that are admin only are gathered in the same directory: the s in /sbin and /usr/sbin and /usr/local/sbin stands for system. A normal user can not even start programs that are in there. Files a normal user can start are in /bin, /usr/bin, /usr/local/bin based on where it most logically should reside. But if they are admin only they should go to the s version of that directory. There is a famous utility called fuser. You can kill processes with it. If a normal user could use this (s)he would be able to kill your session. The same goes for /home: /home/user1 is property of user1. /home/user2 is property of user2. user2 has no business doing stuff in user1's home (and the other way around is also true: user1 has no business doing stuff in user2's home). If all the files would be in /home with no username underneath it you would have to give permissions to every file and asses if someone is allowed to write/remove those files. A nightmare if you have tens of users. /lib/, /usr/lib/, and /usr/local/lib/ are the original locations, from before multilib systems existed and the exist to prevent breaking things. /usr/lib32, /usr/lib/64, /usr/local/lib32/, /usr/local/lib64/ are 32-/64-bit multilib inventions. It is not a static concept by any means. Other Linux flavours made tweaks to this lay-out. For instance; currently you will see debian and Ubuntu changing a lot in the lay-out of the FHS since SSD is better off with read only files. There is a movement towards a new lay-out where files are split in to a 'read only' and a 'writable' directory/group so we can have a root partition that can be mounted read only (partition for a ssd) and writable (sata hdd). The new directory that is used for this (not in the image) is /run/. Late Answer - I've created a roadmap for beginners to follow. If they are looking for a file but don't know where to look, they can use the map to roughly navigate around. You can download a hi-res PNG here. You can find the related post here. I will keep updating both the file and the post when time permits, incorporating helpful comments. This following text shows the directory structure. /home : Contains the home directories of users. /bin : All the executable binaries and commands used by all the users on the system are located here. /sbin : This contains the system executable binaries typically used by system administrators. /lib : Contains the system libraries that support the binaries in /bin and /sbin. /etc : Contains the configuration files for network, boot-time, etc. /dev : This has the device files i.e. usb, terminal device or any other device attached to the system are shown here. /proc : Contains information about the process running. 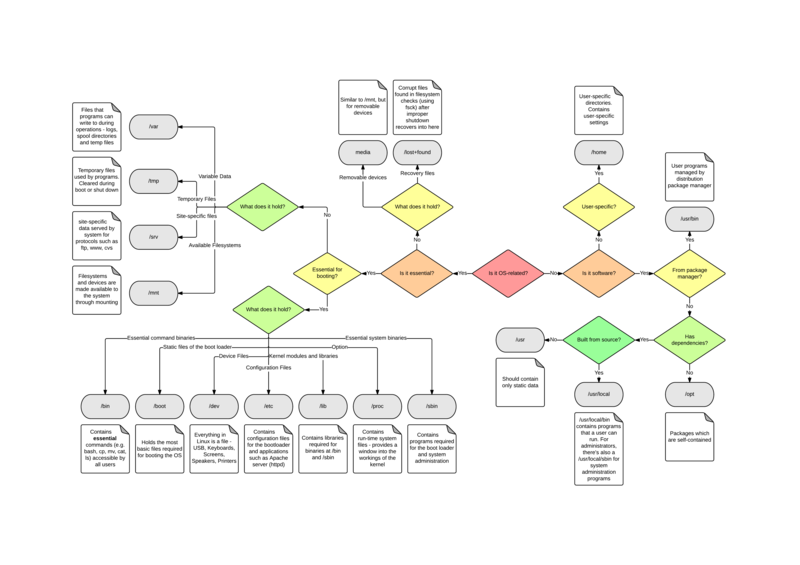 /tmp : This is the temporary directory where many processes create the temporary files required. This is purged each time the machine is booted. For more details, Thegeekstuff link perfectly explain the generic linux file-system. \Users is equivalent to /home. The name of /usr is a historical artifact. /etc is for system configuration files: configuration files that affect all users, whether they apply to the operating system as a whole or to a specific application. /usr is for system code and data (programs, libraries, documentation, etc.). /var is for variable or temporary data: temporary files, logs, package manager databases, printer spools, game save files, etc. There is also /tmp for temporary files that can be erased across reboots. /bin, /lib and /sbin in the root directory have counterparts in /usr. The files that are outside /usr are the ones that are needed early in the boot process. This is a relic from the time when disks were small and /usr might be on a filesystem shared between several workstations over the network, it isn't really a useful distinction on most systems. /boot contains a few files that are needed only to boot the operating system, and not for day-to-day operation. /root is the root user's home directory. The root user is an administrator account not tied to any particular user; it's the user that you change to when you run sudo. Ubuntu doesn't let the root user log in by default. /media and /mnt are mount points: they're where you can see the filesystems of other operating systems and remote drives. The Windows equivalent is other drive letters. /proc and /sys show system information. On Windows, you need to wade through menus or call system commands or install third-party programs to see this information. Ubuntu, like other Linux distributions, generally follows the Linux Filesystem Hierarchy Standard. Ubuntu (like all UNIX-like systems) organizes files in a hierarchical tree, where relationships are thought of in teams of children and parent. Directories can contain other directories as well as regular files, which are the "leaves" of the tree. Any element of the tree can be references by a path name; an absolute path name starts with the character / (identifying the root directory, which contains all other directories and files), then every child directory that must be traversed to reach the element is listed, each separated by a / sign. A relative path name is one that doesn't start with /; in that case, the directory tree is traversed starting from a given point, which changes depending on context, called the current directory. In every directory, there are two special directories called . and .., which refer respectively to the directory itself, and to its parent directory. Not the answer you're looking for? Browse other questions tagged filesystem or ask your own question. What do the abbreviations “etc” and “usr” mean? What is the meaning of “usr”? What is the purpose of the bin directory? What does `ls /` do? Where is the default folder for Apps? Is there an Ubuntu version of Windows' 'System Refresh' option? What is the equivalent of the following directories in relation to windows for ubuntu? How to protect essential Windows files on NTFS partition from edit/deletion in Ubuntu?